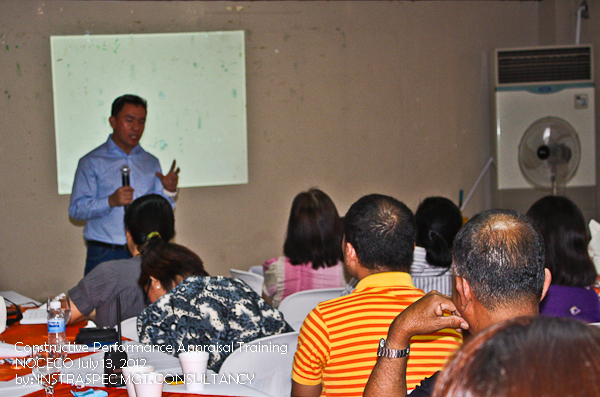 I have recently conducted a training on Constructive Performance Appraisal for the Managers and Supervisors of NOCECO, one of the electric Cooperatives in the province of Negros Occidental. The training was conducted in line with the new Performance Appraisal Program created by Ms. Emmylou Iman, a supervisor in-charge for NOCECO. The Constructive Performance Appraisal Training aimed at equiping line managers with the skills and confidence to conduct those normally “dreaded” Employee Performance Appraisals/Reviews, with positive results in terms of organizational goal achievement, as well as employee morale and competence enhancement. 1. Understand the Benefits of Performance Management as a crucial management vehicle for achieving organization goals. 2. Have a basic understanding of Performance Management, including related tools and techniques. 3. Know how to develop/formulate Goals/Objectives, Key Performance Indicators (KPI’s), Competencies, and Performance Standards. Special thanks to Mr. Jerry Algara, Training Officer of NOCECO for facilitating the training.